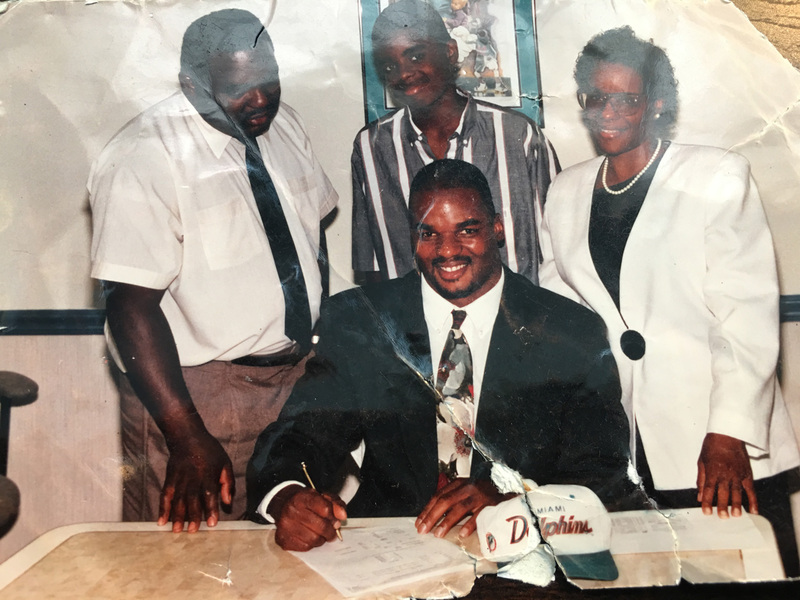 Dwight Hollier is a former NFL LB who played nine seasons with the Miami Dolphins and Indianapolis Colts between 1992-2000. 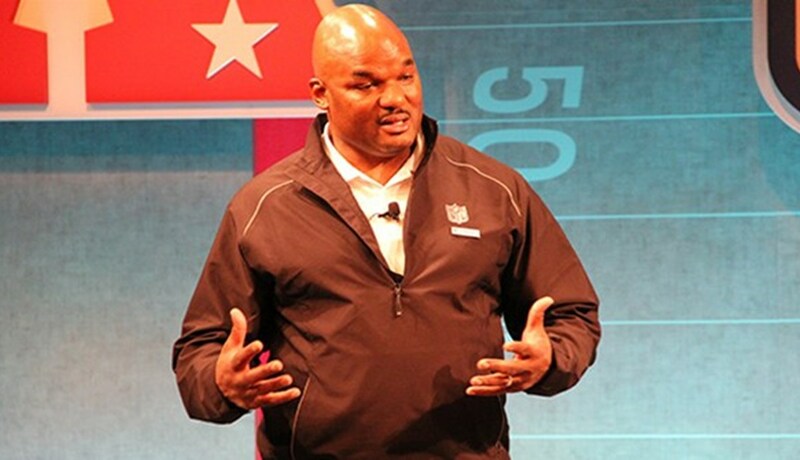 After the game he returned to work at the NFL as the Vice President of Wellness and Clinical Services. Q: As you contemplated your decision to retire from the NFL, what were some of the thoughts that went through your head? I guess I started preparing to leave when I decided to go to graduate school. I made that decision as I was looking around and there was a lot of turnover on the team I was with, the Miami Dolphins. You know, we had just gone through a coaching change, and there was a tremendous amount of turnover. At the same time, younger guys were calling me the old dude in the locker room, and I was like 27 or 28, and they’re calling me the old dude. Now I’m thinking, ‘OK, I should probably start figuring out what I’m going to do next,’ considering the circumstances. So, I took a chance and decided to go back to graduate school, and start working on a master’s degree in counseling. I wasn’t completely sure what the counseling degree would lead to or where it was going, but psychology and the possibilities of helping people spoke to me. Q: Did you face any challenges during your transition? If so, what were they? Where do I start? Did I face any challenges during my transition? Absolutely. It’s hard to figure out where to start talking about those challenges. I was fortunate and blessed in that I had a master’s degree, I applied to a couple of positions, and got hired within two months of receiving my severance, or applying for my severance. But, the reality of that new position, which was a fraction of my most recent salary, and making that adjustment to the new work environment, the expectations of that new work environment, the fact that I was a rookie again, and the pressures and expectations of being a former player all collided at the same time. I was struggling with missing the game, and at the time I didn’t know what it was. I knew that I had this hole, and I was missing a big piece of who I was. I would have a smile on my face and go to work, and inside be torn up. Some of it was because of the loss of the comradery, the locker room, the access to my peers, you know? How do you describe it? There was the absence of identity. I was struggling with missing the game, and at the time I didn’t know what it was. I knew that I had this hole, and I was missing a big piece of who I was. I was so wrapped up in being a football player. I think it’s something that a lot of guys go through … asking themselves, ‘If I’m not a football player, then who am I?’ I struggled with that as well. So, there’s all of these pressures. I became extremely depressed and withdrawn, and struggled a lot for a couple of years. I say that I fell on my face, and I felt that I did a lot of things "right": I went back to school, I got my master’s while I was playing, I had that degree right before I finished my last game, I went to work right away. I did a lot of things the right way in preparing for that transition, and still fell flat on my face in my transition, for the reasons I mentioned, and others I haven’t. I say that I fell on my face, and I felt that I did a lot of things "right." If that can happen to me, it can happen to anyone. Part of the reason I’m thankful for the opportunity I have now is because I get a chance to at least try to help guys avoid that pitfall. So, if that can happen me, then what happens to the guy who only plays a year, year and a half, two years, who thought he was going to play ten, and hadn’t finished his undergraduate degree? So, how do I use my story, my background in counseling, and working with our population to build bridges to a better transition? Q: Knowing what you know now, do you think there are any ways you could have prepared for differently? Yes, absolutely! I think one of the things I didn’t do as well as I could’ve was just networking while still playing. Connecting with community leaders, connecting with different people who are doing the kind of work and jobs that I would perhaps, one day, like to do, and learning more about those jobs. So, internships, job shadows, any opportunities like that – I didn’t take advantage of them. I think that’s one piece that I could’ve done a better job at, gaining some prior knowledge and experience about potential opportunities that might be out there. I would definitely recommend that. Then, staying connected. I think this is a tough thing to do when you’re in the midst of a transition, is to stay connected. Like a lot of guys, I isolated myself. I found myself by myself often, and disconnected from the things I used to enjoy and like to do. I joke that there were a couple of years where I couldn’t watch football. My wife is a big football fan, her dad is a coach, and was a college player – I just couldn’t watch. On Sunday’s for a while, I spent a lot of time mowing the lawn – We had the best lawn in the neighborhood for those couple of years! So, I think staying connected, using the networking opportunities that you’re presented with as a current player and taking advantage of that. That would probably be the same advice for a collegiate athlete as well – asking for business cards, following up with people, connecting with them, learning more about what they do, exploring potential opportunities. I think we, in some ways, get caught up in the idea that if you’re not all in then you’re on your way out, and we have to change that mentality. I think we, in some ways, get caught up in the idea that if you’re not all in then you’re on your way out, and we have to change that mentality. Q: What was your proudest moment from your days playing football? There’s a picture that I carry around with me all the time. It’s beat up and tattered, but I carry it in my travel bag. It’s a picture of me signing my contract with my mom and dad standing by my side, and my little brother right behind me. The pride I know my parents had at that moment, it’s one of the proudest moments for me. That’s a picture I carry around with me all the time, and I really do need to put it up somewhere and stop carrying it around, but it’s meaningful to me. Q: What’s been your proudest moment since leaving football? My initial thought is of the birth of my kids – that's pretty special. That family time is wonderful. Alongside of that, it’s getting this opportunity to serve this brotherhood I love so much. Q: Tell us about your work with the NFL and how you're assisting players now? I work with our staff in the Player Engagement department to help support players through the many challenges of NFL life. We help support through continuing education, professional development, financial literacy and other opportunities. We work with a lot of great programs that are out there including career “Bootcamps”. We also help to support the resources that are already in place, including mental health resources. We partner with many organizations that help provide mental health resources including Cigna, who’s the insurance carrier for the player’s plan and who manages the NFL Player’s Assistance and Counseling Services Program (EAP). The EAP benefit is available to all current and former players and provides eight free confidential counseling sessions per issue for any current or former player and anyone in their household. I also work with the NFL Lifeline which is a crisis line that’s available for anyone that’s in the NFL family. It’s staffed 24 hours a day to help people navigate challenging situations. I also work with The Trust and the NFL Player Care Foundation to help support players who are transitioning, and need additional assistance, resources, and guidance. Those are just some of the resources that we have that I work with in my role to help support players in transition. I’m constantly talking to guys who need guidance and assistance. I work with a group of guys, Transition Coaches, who help to coordinate care for the players. The Trust and our NFL Legends group also have former players who are all available to help support players in their transition. Q: What would you say to another former player who is facing challenges and seeking resources and doesn’t know where to start or what to do? One, it's important to let them know that they’re not alone. We have a team of men and women that are here to support them in that transition. They shouldn't be afraid to ask for assistance, and they don’t have to handle it themselves. I think sometimes, as men, we get caught up in the old teachings around what manhood is or what manhood is "supposed to be." The reality is that we have a number of resources, we have dedicated people who are here to help guys who may not know exactly what they want to do find direction in their transition. We do that through a number of ways, including our resources in Player Engagement, like our boot camp series – personal finance boot camp, sports media boot camp, broadcast boot camp, and our business management boot camp. Then we have our Player Engagement Transition Coaches, we have our Legends Coordinators, and The Trust's Captains. There are a number of resources, a number of people, who are available to support that transition. There’s counseling resources, and a tremendous amount of things available for guys. So, it’s comes back to letting them know that they’re not alone. That there are great resources available, and that they’re still part of our family – the NFL family.